We are really excited to be able to offer these tribal sets. Each one is a little different and so each is unique. Black Velvet base bra and belt with tribal décor. Features tribal braid and trim and pendants. Bra has tie back and halter strap. Belt ties in front. Available in A, B,C, SmD cup only. Please specify cup size when ordering. Currently out of stock. Expecting new shipment October 7, 2008. We have a waiting list...Prepaid orders will be filled first, whatever is remaining will go to folks on the waiting list in order waitlisted. These three items can be worn separately or together. The bra cover is made to be whip stitched or hooked/pinned onto a covered bra base, or worn over a Choli. The bra cover will fit A-small D cup. Belts will hold up best if whip stitched along the top to a fabric belt base, but can be worn alone over a skirt or harem pants. Please state hip measurement when ordering belt. Available in antiqued brass or pewter. Supplies are limited - please contact us before ordering. 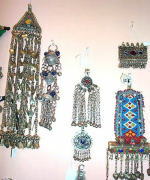 Afgani and Turkoman inspired Tribal Chokers in traditional "white metal" with stone/glass accents. Each one is unique and different. Design pictured is only a representative sample and may not match the one you order. Let us select one for you...we promise to chose each order as if we were selecting it for ourselves. STYLE #3) Approx. 2-1/2 to 3" overall. Light weight with pewter finish. Tribal Pendants - Each unique and different. Designs pictured are representative samples and may not match the one you order. Available in 5 price ranges: Let us select one for you....we promise to choose each piece as if it were for our own costumes! Assuit fabric cap sleeve top with built in bra, back zipper. Straight panel Assuit skirt on elastic hip band. Coordinating Assuit hip sash. Contact us the day you want to order to check on sizes in stock. 3 pc set.